Here are some of my tabloid page designs for The ReMarker. Scroll over the image to see a brief description of the piece at the bottom of the image. Click on the image to enlarge. Due to the striking nature of the page and somewhat unconventional use of white space, work on this cover design began weeks before the cover story was even written. Because of meticulous planning, I was able to effectively use the white space to my advantage. On this page, the reader is drawn straight to the headline and main visual. Beyond the initial eye flow, you will then notice the more subtly placed blur and distortion of the subhead to continue the theme of being "wasted." Additionally, the spot color for The ReMarker logo is a color pulled from the grass of the dominant visual to increase the page's unity. For our most recent cover, we took on a rather bold design: the use of three different covers. 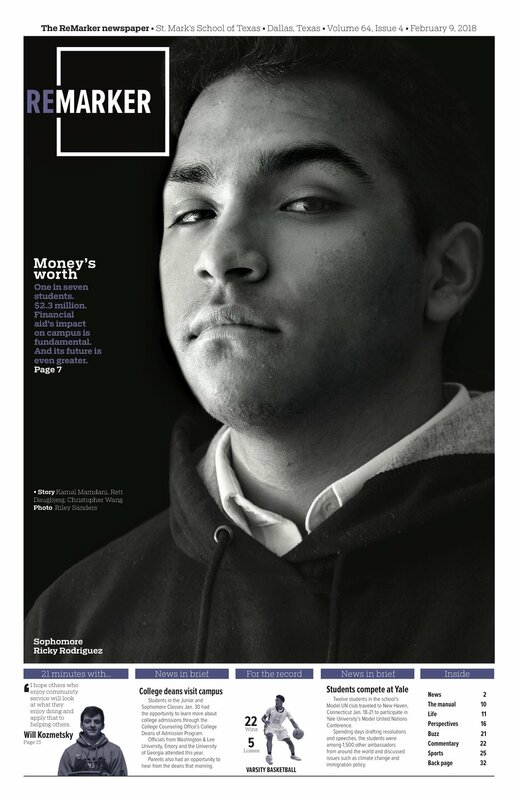 Use the arrow keys to see the three covers we distributed around campus. For a story on fake ID's, we used a glitched-out distortion theme to capture the level of confusion, criminality and secrecy commonly connected with the subject. The eye-catching misconstrued face and disjointed page introduced the topic in a compelling way for the community and sparked chatter across campus. After the haunting events in Charlottesville, Virginia, this cover design attempted to capture the same ominous and foreboding feeling people in our community felt when they saw tiki-torch-bearing white nationalists march around a statue of Robert E. Lee Aug. 11. I also desaturated the colors of the American flag to point the reader to the headline and add to the page's dark mood. Throughout my page designs, I've learned the power of verbal-visual connections. For this issue's cover story on Alzheimer's, I was sure to end the subhead with a phrase to connect the main photo-album-inspired visual with meaning. This cover uses typography as the dominant design element of the page. However, by using white space, balance and subtle photos to break up the text, we included other design elements to enrich the dynamic of the page beyond simply type. A futuristic story on technology in the fourth industrial revolution merits a page that's equally futuristic in design. The contrast of the blue and black here establishes that futuristic theme and is then carried out through the body copy and supplementary infographics. This centerspread was somewhat of a challenge due to the diverse content we hoped to include in a small space — just two pages for two stories, four side-bar interviews and six infographic sets of data. But I overcame this by carefully compartmentalizing the content and using two dominant photos to tie the pages together. Building off of the glitched-out distortion theme from this issue's fake ID cover, I transposed the the typical Texas ID watermarks and seals onto the page. 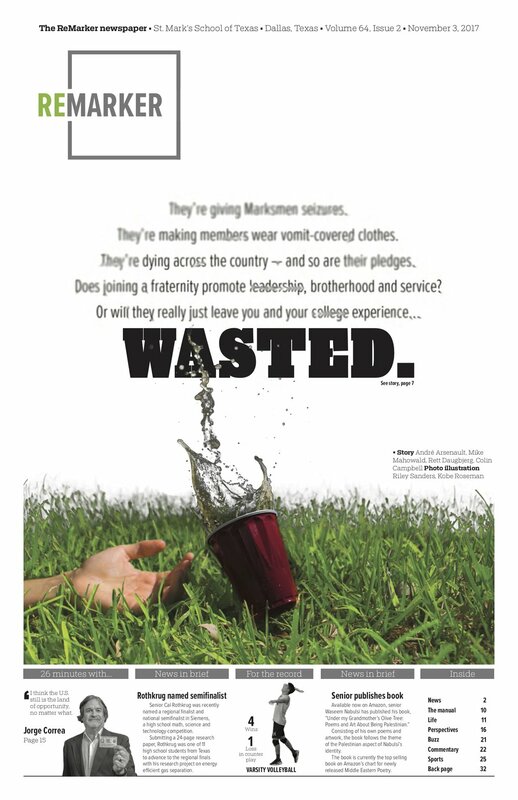 Beyond this, the infographics at the bottom of the page expand the story's perspective to underage drinking statistics and items the typical fake ID owner buys. For the complex topic of cybersecurity, I knew we would need to balance both a local and a national perspective. So when it came to designing the package, I kept this in mind. By juxtaposing the dominant visual of a current student's eye with infographic content, I was able to help shape the story in a localized way. For an in-depth story of almost 3,000 words, packaging everything together in a coherent and aesthetically pleasing way was certainly a challenge. However, when problems like these arise, I always try to compartmentalize with modular elements and unify the best I can. To this day, this page from my sophomore year is one of my favorite pages I've worked on. It's certainly unconventional, but the striking interaction between the dominant visual and the body copy connects the page in an energetic and engaging way. The use of verticality as a unifying design element for the page's copy, photo and infographics all work to my advantage here. Although the story is long, breaking up the text like this provides for more readibility and accessablilty for readers. For all our coverage surrounding the aftermath of the Charlottesville, Virginia protests, I felt I had too many great pictures to choose one dominant photo. With this in mind, I broke the text up with a bar of my photography on the left of the page and additional coverage through infographics at the bottom of the page. This life upfront — the intro page to the life section — ties together a variety of different content in a logical way. With so much going on, it was important to not let the page look too busy or overcrowded. Embracing the design freedom of our back page, for this story on sports nutrition, I used a photo illustration and an alternate copy style to tie everything together in a reader-friendly way. 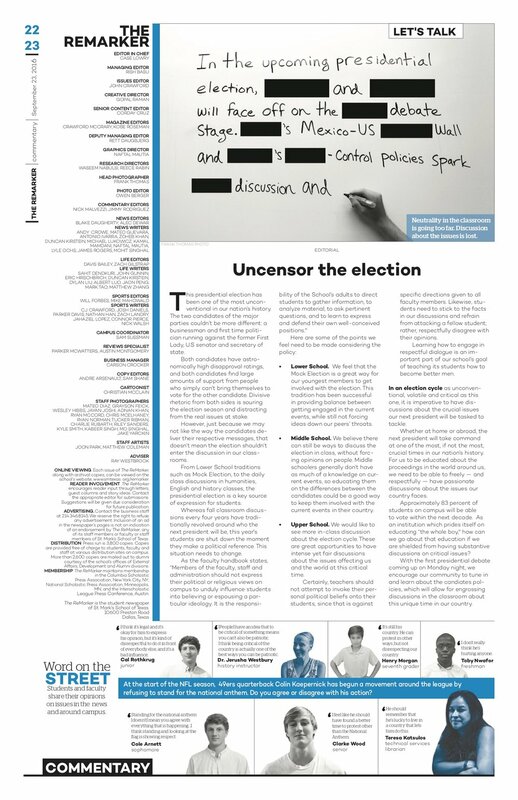 When redesigning our newspaper last year, we decided to rework our commentary pages. In this page, we introduced the new "word on the street" and dominant visual to the commentary section.